14 They will still bring forth fruit in old age. I want to finish my life well. In Hebrews 12:1-2, we are called to throw off all the things that hinder us and the sin that so easily entangles us to run our race. I am not sure how many days I have left on this side of heaven, but I want each one of them to mean something from an eternal perspective. If possible, I want to increase in anointing, I want to increase in effectiveness, and I want to increase in fruitfulness as I get older. 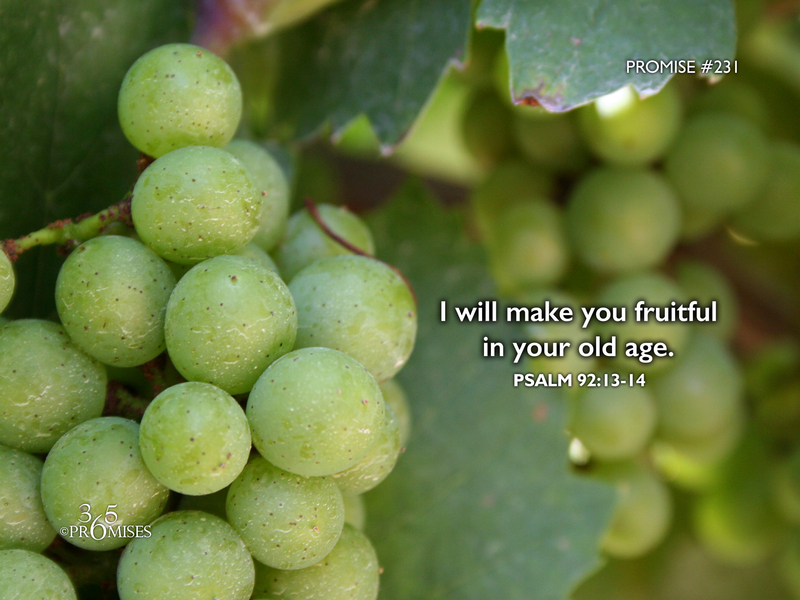 Today's promise says that fruitfulness will abound in old age for those who are sons and daughters to the Father. If you have ever visited a seniors' home, you know that is not always the case. Unfortunately for some people, as they get older, they experience more disappointment and disillusionment about the very meaning of life. Regret and bitterness can grow into a very bitter root. But this is not so for those who are called by God to live a fruitful life! Let's all claim this promise for ourselves and our loved ones today! Father, we thank you that our fruitfulness will bring glory to you, not only today, but for the rest of our lives. In Jesus' name I pray.